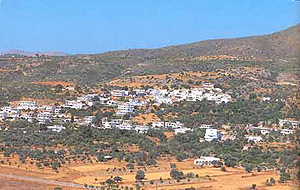 The village of Kalathos is part of the Municipality of Lindos. Kalathos situated in Kalathos Bay, 6 km by road of Lindos, 45 km from the city of Rhodos, and from the airport. A small traditional village local population approx 400 resindents, which has kept its beauty. There are a a lot of restaurants and Greek tavernas, to choose from. The Village is on the main Lindos to Rhodes town road, there is a regular bus service between during the day. Kalathos is a very good base to explore the surrounding areas either by bus or rent a car. The shingle beach is a 15 minutes walk from the village of Kalathos over half a mile long with an array of sunbeds and tavernas. Sand and tiny pebbles as far as the eye can see. The vast beach stretches along the shore for 4km,some parts are commercially run others are free.